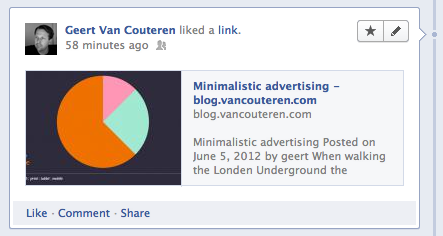 Recently Facebook announced Facebook for WordPress, time for experimentation. As one could expect the Facebook plugin supports “liking posts” as we know it, although still struggling with individual posts on an overview page. But this issue appears to be resolved with the 1.0.1 update, together with most of the formatting issues. Together with the basic functionality the plug-in also offers Social Reading support and a suggestion box and the bottom of the page. In this box personal suggestions are shown based on your visitors liking behavior. This comes right out of the plug-in-box but is only as powerful as the Facebook community you address with your website. With Social Reading you can offer the same functionality on your blog as the guardian and the likes, allowing visitors to share automatically what they read on your website. This entry was posted in web stuff and tagged facebook, wordpress by geert. Bookmark the permalink.